Vegan diets are all the craze but vegan fashion is a term that is gaining traction as the likes of Vaute begin to hit the runway. The emerging label by Leanne Mai-ly Hilgart had its first ever NY Fashion Week premier yesterday, marking it as the first animal-rights all vegan fashion label to show during New York Fashion Week. The young designer is building upon the outerwear and tee line she’s had for several years to show off a ready-to-wear line that includes tops, satin dresses, skirts, pants and sweaters made from vegan and eco fabrics for both men and women. Hilgart paired her looks with vegan men’s shoes by Novacas for Brave GentleMan and vegan women’s heels by Love is Mighty Check out Ecouterre’s exclusive photos from the presentation. A mix of innovative fabrics dominated Vaute Fall/Winter 2013 collection. Hilgart has been working on research and development to introduce several fabrics such as luxe organic cotton velvet, recycled Thinsulate, 100 percent recycled satin and organic fleece. Her motivation- “I want to show that we don’t have any excuse to wear animals,” explained Hilgart. The new fabrics were combined in different ways to serve different functions. 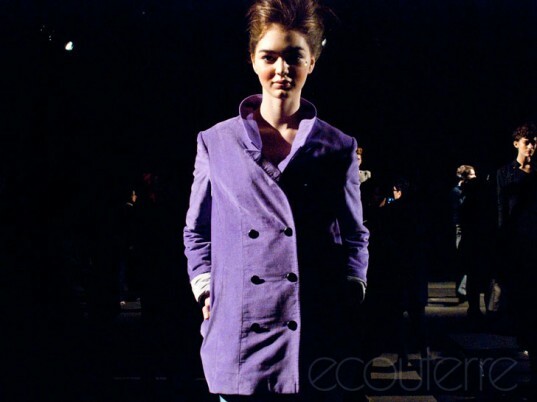 For instance, a purple velvet coat was quilted with recycled Thinsulate, making it both warm and breathable. Organic cotton button-up tops featured recycled satin pockets and collars, offering a variety of textures in one garment. Waxed canvas gave a short overall-type dress its own structure not to mention an interesting sourcing story- Hilgart found the material from a supplier in upstate New York that has operated as a family business for over 20 years, providing the rugged fabric mostly for the farming community in the surrounding area. While a variety of fabrics were on display, the collection was united by a somewhat playful, yet edgy look dominated by a palette of blacks, blues, greys and tans. Hilgart was heavily inspired by anime, specifically the all famous “Sailor Moon” series. Perhaps the signature piece of the collection is a 100% recycled satin high-waisted dress that is enlivened by a big playful bow attached to the back and a cut-out heart in the center of the chest. A pair of organic cotton velvet overalls worn over a printed organic cotton collared shirt were reminiscent of a sophisticated version of children’s wear. Iron-on star and “V” patches added a whimsical touch to the otherwise clean designs. One shirt even stated, “Meow or never friends forever,” a tribute to the fact that the show was sponsored in part by the Humane Society of the United States. 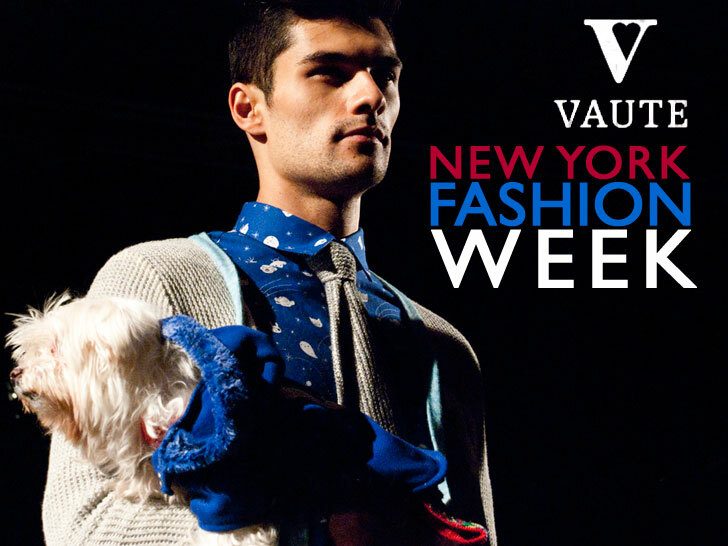 Several of the models held live dogs that were up for adoption, adding a hint of activism to the show. When asked if Hilgart had a favorite design from the collection, she answered, “I surprised myself with [the] sweater dress, which I really love because I think it’s really fun to wear as a dress even when it’s cold out. I love slouchy. I’m a little ’80s inspired.” The overalls and a waxed canvas version of both a men and women’s biker jacket were also updated throwbacks to the 80s. Staying true to her animal-free commitment, Hilgart also carefully accessorized her collection. Vegan shoes by Love is Mighty and Novacas for Brave GentleMan gave the models an extra sophisticated, edgy vibe while hand-knit hats and scarves by Pick Up Stitch softened their look slightly. Stay tuned for a soon-to-come exclusive interview with Hilgart to find out more “behind the seams” information regarding the brand’s latest developments.